How to calculate property square footage? ForumsArrowReal Estate Development & New Home ConstructionArrowHow to calculate property square footage? 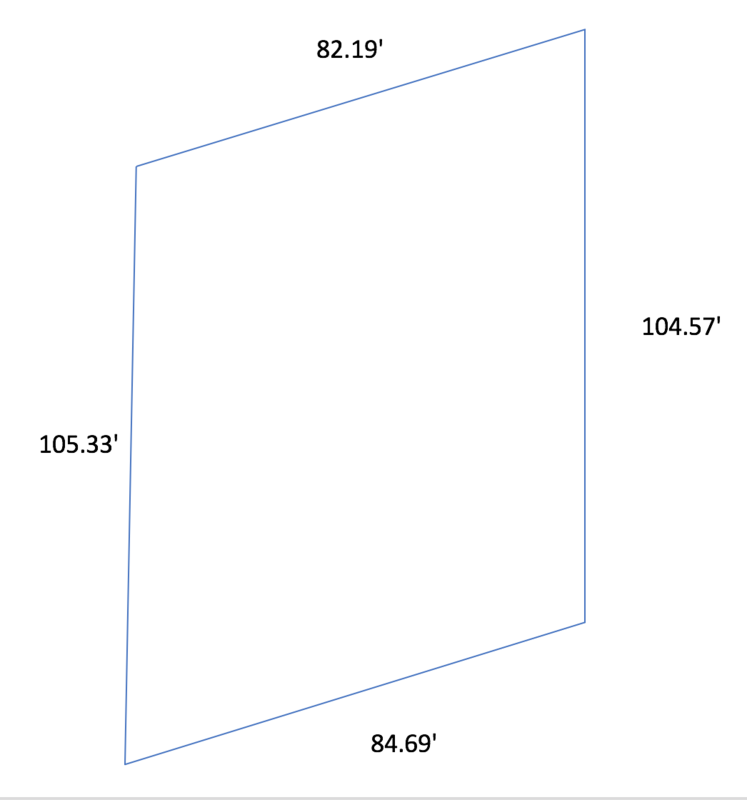 I am building an ADU on my property and need to know the total square footage of the property. It seems straight forward, but it's a complicated measurement. Length x Width = Area right? It's not that easy unfortunately. I have had an expensive topographic survey done, however my Architect and Surveyor struggle to provide the total square footage. The shape of the land is an irregular quadrilateral with no known angles. All 4 lengths are known. Can you please help? I can kind of understand the surveyor since they are providing the existing conditions, but your architect couldn't provide this? I am an architect. This does not seem complex at all. Quite easy in CAD. What are all the angles @Matt Mainini ? EDIT: just saw that you said no known angles. Why isn't your surveyor able to get the angles? That's kind of important. Perhaps he can provide angles, but I think they just use CAD to do that (I will ask the surveyor). I believe with only 1 angle it will be possible to calculate. @Matt Mainini , This information should be available through the assessors office, http://sccounty01.co.santa-cruz.ca.us/ASR/. Put the parcel number in the search engine (preferred) or the street address and this should provide you with a wealth of information. What can be done about this? If these are accurate can I at least lower my taxes by contacting the tax assessor? How do I approach them? This is a 10 minute task in cad. Tell your surveyor you are too busy to pay him. I would take the survey into the Building dept, but you have a case to lower your taxes. You will need the survey (3rd party verified) to state the sq ft or some unit of area measurement.